Glide past fairy-tale castles and medieval villages as you cruise the Danube River aboard Tauck's ms Savor or ms Joy. 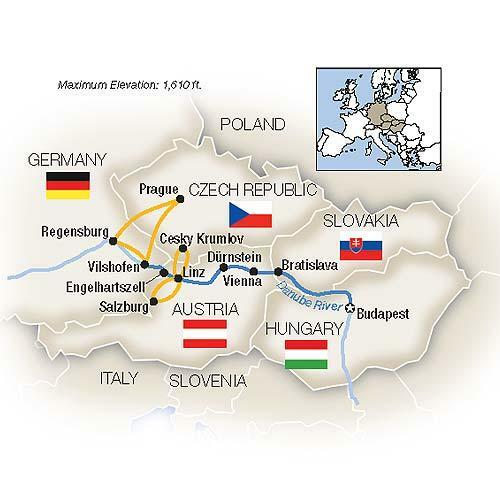 Explore Budapest, Bratislava, Cesky Krumlov, Salzburg, Vienna and Prague - plus the castle-studded Wachau Valley - taking in views of Hungary, Slovakia, Austria, Germany and the Czech Republic. Attend a private Imperial evening with dinner and music at a palace in Vienna... a wine tasting in Dürnstein... spend a day in Mozart's Salzburg or medieval Cesky Krumlov... take an exclusive private tour of Baroque monastery libraries in Prague... discuss contemporary issues and historic events in Slovakia with a resident expert... and enjoy evenings of cultural entertainment on and off your riverboat. In Vienna, see the Imperial apartments at the Hofburg or tour opulent Schönbrunn Palace. Admire frescoes, stained glass windows, and stunning architecture as you spend two nights each in Budapest and Prague in city-center hotels, checking out remarkable bridges, cathedrals, museums, and grand Habsburg palaces! Tours of April 8 & July 15 will disembark in Straubing, Germany. Although not expected, Tauck reserves the right to alter the sequence of ports or omit or substitute scheduled ports or attractions at any time without prior notice. East and west itineraries are similar.